Whether your kids have hyperlexia or not, these 20 fun alphabet activities for kids will keep your kids busy all summer long! If you have a child with hyperlexia, then you likely already spend hours upon hours playing with all things alphabet related. But maybe you want to mix up your child's play a bit this summer, help them keep cool, or explore their passion for letters in a new and creative way. Whatever your reason is, these 20 summer ABC activities for kids are a great way to beat the heat the summer (so cliche, I know). With lots of water and ice play and tons of chalk, your kids are going to have an amazing summer with this collection of amazing alphabet ideas for summer. 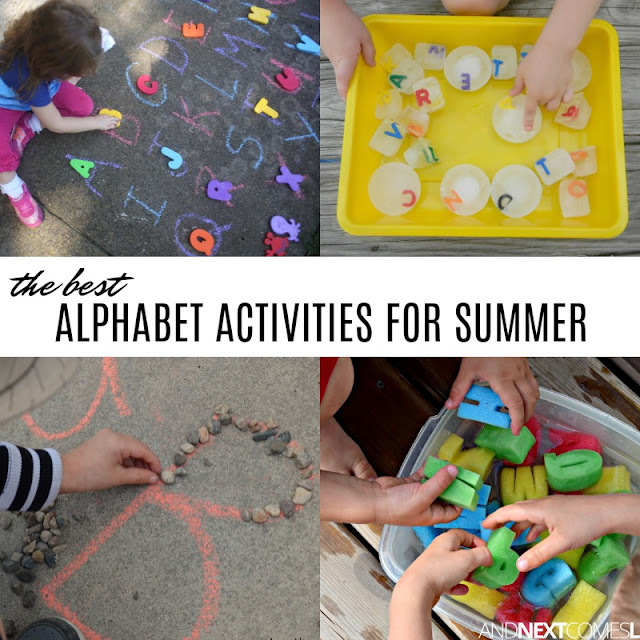 20 Ridiculously Fun Alphabet Activities to Keep Kids Busy All Summer Long! 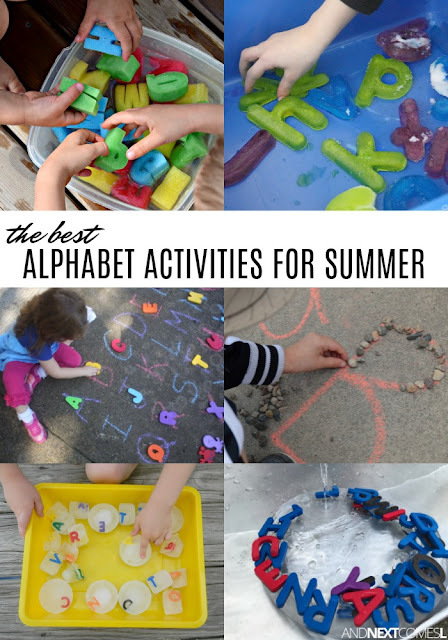 Water play and chalk are two staples for us when it comes to summer time so it's no surprise that this list of summer alphabet activities for kids features lots of water and chalk activities. I even hinted to it earlier! But you'll also find lots of ice activities as a way to keep cool because ice is nice...I am full of cliches today apparently. 1. Outdoor Alphabet Scavenger Hunt - Take a stroll through the neighborhood and see if you can find something that starts with each letter of the alphabet. 2. Stamping with Alphabet Sponges - A perfect activity for when the weather is hot. Stamp words on the sidewalk with alphabet sponges. 3. Chalk & Rock Letters - Go rock collecting and then try tracing chalk letters with the rocks your kids find. 4. Building Giant Letters Outdoors - Grab some scrap wood, twigs, or whatever you can and build gigantic letters outdoors. Then walk along them like a balance beam or jump over them. Be creative! 5. Alphabet Target Practice with Water Guns from I Can Teach My Child - Water guns are a favorite during the summer so why not use them for a little alphabet target practice? 6. Alphabet Soup Sensory Play from The Letters of Literacy - A simple yet classic sensory activity that will keep your kids cool too! 7. Alphabet Water Tracing from Artsy Momma - Do you have one of those foam ABC floor mats? Take them outdoors for this simple idea. 8. Outdoor Alphabet Chalk Tracing from Artsy Momma - Or try tracing letters with chalk and those ABC floor mats! 9. ABC Water Play Park from Childhood 101 - A water park where the letters of the alphabet come to play. Seems like a hyperlexic's dream! 10. Ice Alphabet from Still Playing School - The kids will love to keep cool with these homemade ice letters. 11. Alphabet Ice & Shaving Cream from Learning 4 Kids - If your kids prefer more messy play, take this fun activity outdoors. The ice will keep them cool while the shaving cream will give them some tactile sensory input. 12. Alphabet Ice Boats from School Time Snippets - This is such a cute idea! 13. Alphabet Ice Cube Sensory Play from Stir the Wonder - Another cute ice activity to keep the kids cool this summer. 14. Water Painting from Coffee Cups & Crayons - Trace the chalk letters with water to practice writing. 15. Alphabet Ice Excavation from Teaching Mama - Oh no, the letters have been frozen into a giant ice cube and it's up to your child(ren) to rescue them! 16. Magnetic Letters on the Garage Door from The OT Toolbox - I don't know about you, but my hyperlexic son LOVED his alphabet magnets so much and played with them all the time. Take them outdoors and stick them to your garage door (unless you have a wooden one like we do...). 17. Blowing Bubbles Alphabet Sensory Bin from The Kindergarten Connection - Blowing bubbles is another perfect summertime activity. Combine it with some letters in this cute sensory bin idea. 18. Watering an Alphabet Garden from Toddler Approved - An alphabet garden is a perfect garden for a hyperlexic kid, am I right? 19. Outdoor Alphabet Match for Toddlers from I Can Teach My Child - Match the foam letters from a pool to the chalk letters on the driveway in this simple activity. 20. Alphabet Bug Spray from Toddler Approved - Your driveway has been infested by alphabet bugs and your child needs to grab the bug spray to get rid of them all. Super cute idea!